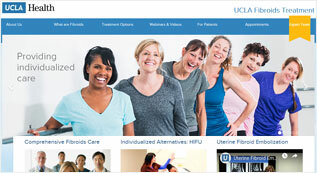 At UCLA we provide a unique, comprehensive and multidisciplinary approach to the diagnosis and treatment of uterine fibroids. For women with fibroids, we are dedicated to providing sophisticated, individualized and collaborative care by an expert team of specialists led by gynecologists and radiologists. OBGYNs advocate for women's health at the annual ACOG Congressional Leadership Conference on topics including maternal mortality and the opioid crisis. 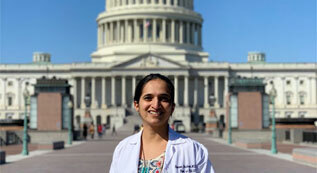 At this year’s conference held in Washington, DC, Dr. Sridhar lead UCLA OBGYN residents in meetings with Representative Ted Lieu and Representative Raul Ruiz. The BirthPlace Westwood and the BirthPlace Santa Monica are comprehensive maternity centers that provide private rooms, family-centered care and offer a wide range of services to make your birthing experience an event to cherish. UCLA OBGYN counts on your generous support to sustain our innovative programs, allowing us to provide exceptional gynecologic and obstetric health care for women by emphasizing the whole patient.